You’re not hallucinating. This is a stomp box that adds a Japanese robot woman singing along as you play. 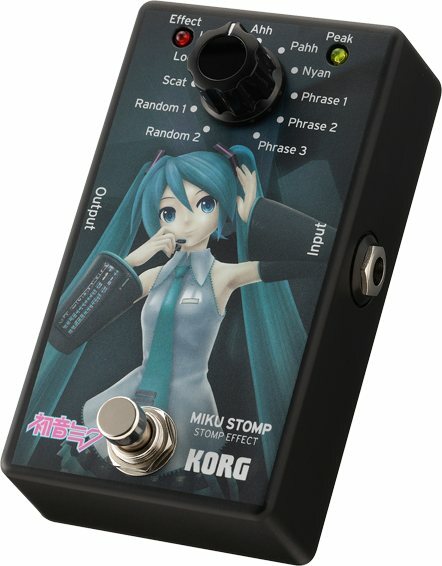 If you’ve heard the now-popular Vocaloid effect, this is that, in a stompbox. Hatsune Miku sings when you play your guitar! A design that fuses the worlds of Hatsune Miku and guitar effects. Nearly unlimited possibilities; 11 lyric patterns are provided. Lyrics for “Senbonzakura” (a Japanese song) are preset. An iPhone app for entering lyrics is available, so you can make MIKU STOMP sing your original lyrics. This all uses the latest Yamaha engine to make the sounds – “she” sings along to your actual playing. You can also use an iPhone app to add your own lyrics – though I’m all for adding Senbonzakura to your set list – enter them via your pickup, and cue your new robot lead vocalist with your foot. Although this iPhone app can be used with an English system, MIKU STOMP’s vocal functionality supports only Japanese. While it does not support input of English lyrics, it does support input of “romaji,” the method of using the Latin alphabet to express Japanese. When entering Japanese directly, “hiragana” and “katakana” input are supported. Right. So, “Pahh” it is. The aluminum diecast body of this compact effect carries a specially commissioned original illustration. The design achieves a fusion of Hatsune Miku’s world and the world of guitar effects. Whether you place it on a table or include it in your effect pedalboard, MIKU STOMP will certainly stand out and make your performance that much more enjoyable. Yes… put it on a table. It’s a decor option. And so concludes the oddest news of this week.